A Square, #565, 8th Main, 4 Block, Koramangala, Bangalore 560034. Ta'am was touted as a vegetarian restaurant specialising in cuisine from the middle-east and sounded promising enough for us to forego our carnivorous tendencies last weekend! I was hoping to find dim lighting, flimsy curtains, large cushions and trance playing in the background (blame it on my regular dose of Bollywood:)) so I was disappointed to see the stark decor of this no-frills eatery. Impersonal fluorescent lighting, granite topped tables and the only thing that matched my expectations - the comfy low seating against a wall with colourful cushions thrown in. However, my disappointment at the interiors took a backseat when the food arrived. We had ordered a hummus platter, a vegetarian platter and some extra falafel with hummus and baba ghanoush. The veggie platter had a humungous amount of a crunchy and vibrant looking salad which we just couldn't get enough of! 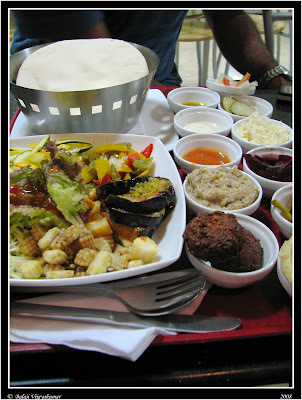 It was accompanied by pita bread, an array of pickled vegetables, olives, tahini, hummus and sauces. The hummus platter, similar to the veggie platter minus the salad, had falafel and a generous helping of hummus as well. The platters were large enough for two people to share easily. 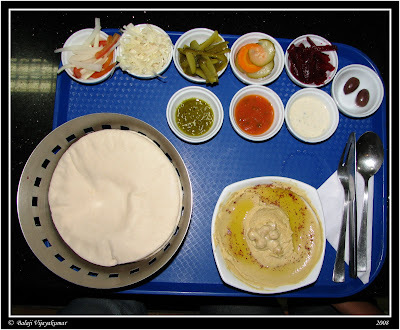 The pita was soft and fluffy and it is eaten with a filling of all the items in the platter. The staff at Ta'am was helpful in showing us how. You break the bread in half, smear the inside with hummus, add the stuffing inside the pocket and top it with tahini and sauces. The stuffed pita tasted deliciously fresh and makes for a wholesome meal in itself. The falafel, which is a fried patty made from chickpeas, tasted very much like our masala vada! It is a common street food in the middle-east and is considered the national food of Israel. The hummus, again made from chickpeas, was appetizing. Baba Ganoush seemed like the Arabic avataar of the desi baingan bharta and did not taste any different from our version either. Surprisingly, the tahini, a popular accompaniment with many Arab and Mediterranean dishes, paired well and wasn't bitter despite being made from ground sesame seeds. This could be because of the middle-eastern method of making it, by hulling the seeds before they are ground. The meal ended with a complimentary baklava. The chef somehow got the pastry wrong by adding too much ghee to it but we were ready to forgive him because of the amazingly authentic Arabic food that we had! We heard that he was trained in Israel for three months and it does show in his cooking! The prices are as honest as the food. The portions were big and the ingredients - fresh and authentic. They do, however, need to work on their service. The food was long in coming and our drink orders did get mixed up. But the servers are polite and were a great help while ordering, offering good suggestions. Ta'am definitely lives up to its name (it means 'taste' in Hebrew). This place delivers true middle-eastern cooking at incredibly reasonable prices. And they really know how to make you eat your vegetables...the kind of place my mom would approve of! ...............................that in Egypt, McDonald's has their version of a falafel sandwich - McFalafel? ..............................that according to the urban dictionary baba ganoush is slang for 'a guy or girl from the Middle East or India who is throbbing hot'? ;) !!!! PS - Here's an easy-breezy recipe for falafel. We haven't tried it yet but it sure seems simple. If you do make it, we would love to know how it turned out. 3 READERS CLICKED HERE TO COMMENT ON THIS POST. ADD YOUR COMMENT!